US Customs and Border Protection does not consider country of origin or human rights activism to be determining factors for admissibility, according to a statement by agency spokesman Jaime Ruiz. But the agency is prohibited from discussing specifics why Mindanao activist Datu Jerome Aladdin Succor Aba was denied entry to the US despite having his ten-year multiple visa. For youth group Anakbayan-Canada, that shouldn’t come as a surprise. The security agency just provides a welcome breadth of material on the purported sanctity of the border and on wrongful external attribution of “terrorism” as hypothesized (i.e. Islamophobia, political opposition, etc.). Jerome Aladdin Succor Aba, 25, a Moro (term for Muslims in the Philippines) activist who co-chairs the SANDUGO Alliance of Moro and Indigenous Peoples and serves as spokesperson for Suara Bangsamoro. He was scheduled to arrive in San Francisco, CA upon invitation by the United Methodist Church and the Sisters of Mercy of America to shed light on the human rights situation in Mindanao. Aba was tasked by the International Coalition for Human Rights in the Philippines (ICHRP) to talk to religious groups and government officials, including members of the US Senate and House of Representatives in Washington D.C. about the plight of the Moro and indigenous peoples under martial law in the Philippines’ southernmost island. He was granted a ten year multiple entry Visa. However, US Customs and Border Protection officers apprehended him at Immigration, confiscated his Visa and luggage, tied plastic cuffs around his wrists, and brought him to five different rooms where he was subjected to physical and psychological torture. His civil and political rights were violated and his right to counsel was suppressed. “The unlawful detention and deportation of peace advocate Jerome Succor Aba shows what oppressors do when we attempt to expose the truth and injustices. When we were given an explanation of that classic and lame visa-problem excuse, we know that it is their attempt to mask their suppression on human rights work. It is important to note that the populist Trump, who has been vocal of his anti-immigrant, anti-Muslim, and racist rhetoric, has not been denouncing hate crimes and has been signing anti-people policies in the US which, therefore, shows that he and his administration have no regard for human rights,” said Fatima Kaalim, Anakbayan Toronto. “[It] is a clear sign of America’s fear. Fear that they will be exposed. Fear that peace will overcome militarism and imperialism. Fear that a human rights advocate from the Philippines will tear down the fabric of their guise of democracy and justice. Jerome Aba’s entrance into the US and participation in the National Ecumenical Advocacy Days would have raised considerable awareness for the Bangsamoro people of Mindanao. 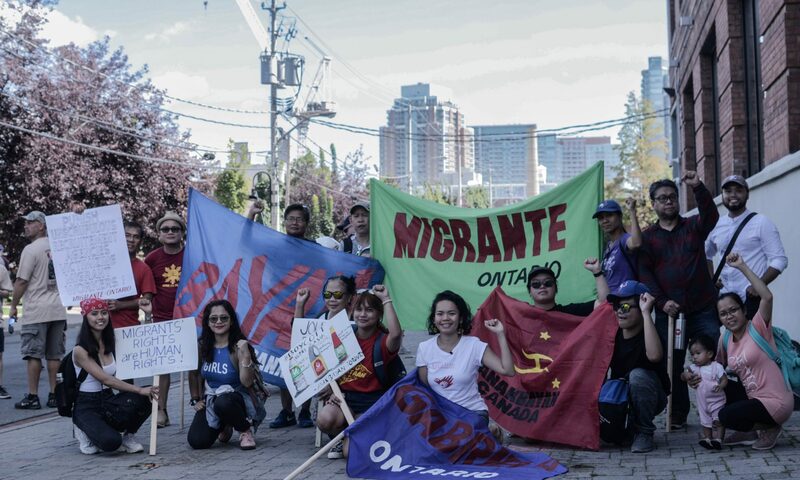 He would have highlighted the plight of Indigenous Peoples of the Philippines under Duterte’s fascist rule, and the effects martial law has had on Mindanao,” said Nicole Sudiacal, Anakbayan Ottawa. Aba’s ordeal showed beyond doubt that the US as imperialist is the real and foremost terrorist. For Aba, his experience was “laughable“ because the supposedly strongest nation in the world is threatened by his presence. For the mass movement, the fight for truth, justice and freedom continues. “The deportation of Jerome Aba by the US state demonstrates what is the most threatening to fascist rule: the alliance of the sectors continually attacked, killed and displaced by the Trump-Duterte fascist order. Aba, leading the strongest anti-imperialist alliance of Muslims and Indigenous Peoples in the Philippines, demonstrates that political power that multi-sectoral unity is possible. With the escalating resistance against imperialist resource extraction and wars of aggression around the world, we should all the more condemn the criminalization of Jerome Aba and all land defenders!” said Allos Abis, Solidarity Officer of Anakbayan-Canada.